I wrote this Wednesday night. 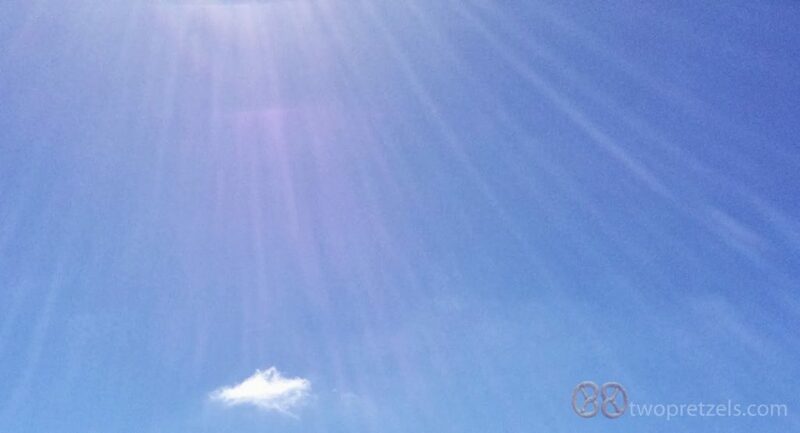 The Cabo sky outside of my office – 3.6.2014. Love that one cloud. Beautiful. I’m so sad. We’re just 4 days away from the six month reminder of her death and I’m sad. By the end of the day my body hurts. My neck, my back, my shoulders… they’re just the physical reminders of the physical effect of grief. (Because you totally need a physical reminder since the emotional ones aren’t enough. Ugh.) I remember in the days after her death my sister and I both commented that we hurt physically… our bodies and our hearts. At six months, the Niagara Falls of sobs have been replaced by scattered instances that produce round, full tears that seem to drip from my eyes without me knowing. At any time of day. The instinct to call her 15 times a day has decreased to just once a day. I let it ring about 20 times. …and then I hung up and I cried. I feel like these past six months I’ve been holding my breath and when I talk to her again, I’ll be able to exhale. I feel this has all been some sort of awful dream that I can’t wait to wake up from and tell her all about. Because she’s my Mom. And this is boring, regular stuff we usually talk about. In losing her, I lost my ally. In losing her, I lost my always-loving ear. In losing her, I lost my compass. And then we’d laugh. And I’d tell you I love you. And you’d say you love me, too. And then we’d hang up the phone and I’d go to bed knowing that you were ok and most importantly that it was all just a dream. And the world would feel whole again. All that stuff DID happen. All that stuff has happened. And she’s gone. So six months later, I cry. I cry because I miss her. The other night I was watching a movie. One of the characters got into a car accident and it showed the impact of her body slamming into the steering wheel. So six months later, here I am. Her death and my grief is like the ticker-tape at the bottom of the TV screen. The one that runs election results, or school-closings, or more importantly pop culture news on the E! network announcing who is pregnant or who is divorcing or that Chris Brown has anger management issues and is seeking treatment. The ticker tape is ever-present while the TV shows just keep playing in the foreground. Her death is ever-present and the shenanigans of my life just keep playing on. That’s another hard part. My life is moving forward. I have conflicting feelings because I’m making memories and decisions that she doesn’t know about. I miss her input. And I’ve had to take my hands from this keyboard and cry a couple of times while writing this because still today, tonight (because everything is worse at night), it’s just so overwhelming. I’ve had to feel the before-bed-washed-face moisturizer sting my eyes as I sob. As I put my head into the pillow on my lap and audibly cry. Grief isn’t pretty. It’s not silent, either. And she’s worth a sob or two. Six months later, I don’t sob everyday… like I once did. So six months later, do I feel normal? And I don’t think I’ll ever feel “normal”. Nor do I want to. My life is now different. I don’t feel like that anymore. Well, not all the time. So six months later, I just want people to remember. To remember her. I want people to know how incredible she was. I want to hear people say her name. Some days I carry better than others. Next week I’ll take the same flight back to Springfield, Missouri. The one I took, alone, the day after she died on September 10th. I’ll walk through the same terminal, alone. I’ll hug my sister and I bet we’ll cry. But I sort of hope we just laugh. Then at some point, together we’ll drive down her driveway one last time. We’ll sit on the floor of her abandoned house and I imagine we’ll cry some more. I hope we feel her in those moments. The finality of her death will be further cemented when we sign those closing papers. All of this… in the blink of an eye. So at six months this is where I am. Grief shared is grief diminished. « Um. Because baby owls are awesome.